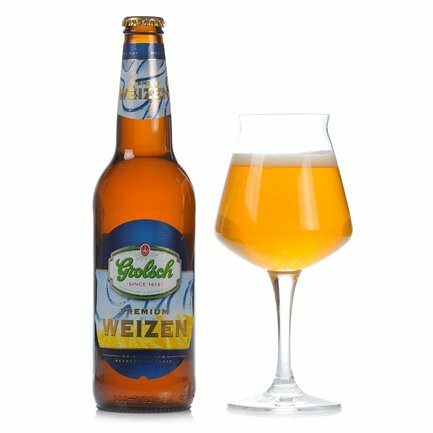 A prime expression of Dutch beer-making tradition, presenting Premium Weizen by Grolsch, a distinctively tasty and refreshing beer. Finest wheat malt, barley malt, yeast, hops and water: these are the rigorously selected ingredients of this deliciously flavoured beer. Pale gold, available for a perfect sip of freshness at any moment. "Vakmanschap is meesterschap" - i.e. Craftsmanship is mastership - is the motto on every bottle of Grolsch beer, expressing the company's founding vision. Grolsch was founded in 1615 in the town of Groenlo in Holland, whose beer-making pedigrees stretch back through the mists of history. The company's eventful development over the centuries has always demonstrated courageous choices, unwavering passion and rigorous selection of the best ingredients. Thanks to its powerful and unmistakable flavours, Grolsch has today claimed its own space on the world's markets.